As a supplier of connectors for trusses and engineered-wood products, Simpson Strong-Tie has been involved in the structural building component industry for	decades. This experience has provided invaluable insights into the needs of the component manufacturer and resulted in the latest addition to the Simpson Strong-Tie product line for light-frame construction. Component Solutions® Director™ manages all of your projects, regardless of size- from a single component to a large multi-plan development. Tailor your workflow and manage your project tasks from quote to invoice. Component Solutions® Truss Studio™ is a fully integrated, easy-to-use layout and truss design solution. This streamlined truss-centric program delivers simple, yet powerful design tools. 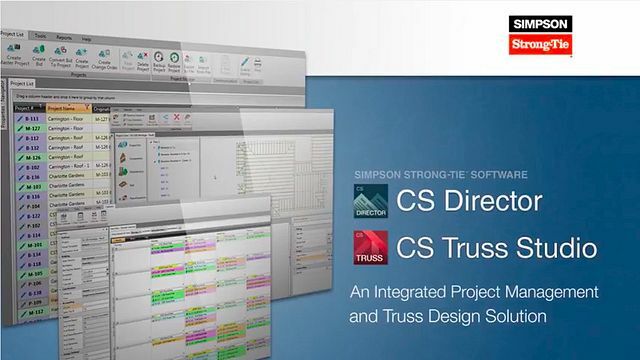 The new Component Solutions® Director™ and Truss Studio™ software has been designed from the ground up to provide easy and flexible solutions for your business. This introductory video provides a peek into some of the benefits of the latest addition to Component Solutions software.